The Magic Bay of Imsouane. What can we say, this spot lives up it’s name with two beautiful surf spots, great fresh fresh fish, a beautiful coastal drive and most famously it is home to the longest wave in Morocco! This isolated surf hub is a village surrounded by a wild mountainous coastline. Imsouane is roughly an eighty minute drive to the north of Tamraght, nestled on the coast between Agadir and Essaouira. 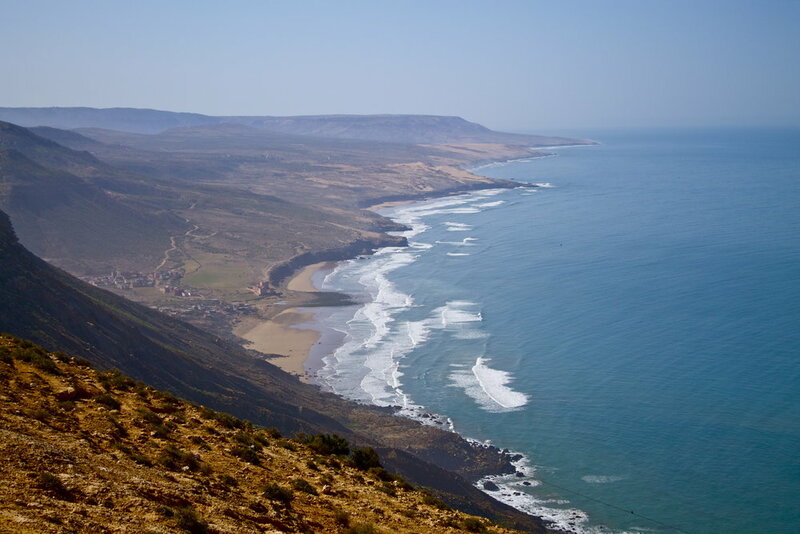 We believe the drive in itself is worth the trip, heading along the coastline and past some of Morocco’s famous surf spots, then winding inland along mountain roads and though smaller remote settlements, until finally heading back to the coastline and arriving into the sleepy surf village of Imsouane. Imsouane is a mix of a traditional fishing village and laid back bohemian surf paradise. P.s. keep your eyes peeled on this drive as you spot some goats in trees! Imsouane is home to two surf spots The Bay and The Cathedrale. The most renowned spot of Imsouane is The Bay, a point break which boasts the longest wave of Morocco with rides up to 600 metres, this glassy right hand wave is not to be missed and a firm favourite for longboarders. From the ocean, you have spectacular mountain views wrapping around this very special natural bay. The second spot is The Cathedrale, both a beach and reef break it offers up some fun right and left hand waves. Between these two spots, it’s less than a 5 minutes walk, making it easy to switch between the two. Imsouane is known for its fish! The roots of the village lie in it’s fishing culture with a local fish market selling fresh fish daily. Enjoy a fresh fish grill at our favourite cafe, Chez Hassan (aptly named) which overlooks the bay - we take lunch here to break up the day, soak up some sun as well as the majestic views. The village of Imsouane is worth exploring, this small relaxed village is walkable by foot and has a great collection of surf shops, cafes, smoothie spots as well as the more traditional crafts. Also, it’s worth keeping an eye out for the growing street art scene with pop up wall murals of all sizes around this sleepy village.